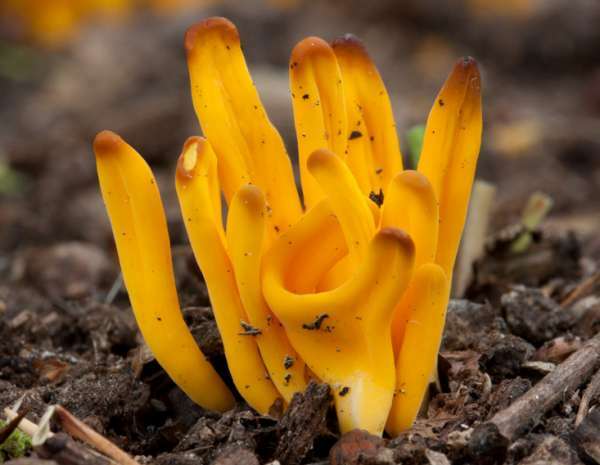 Commonly referred to as Golden Spindles, Clavulinopsis fusiformis (syn. Clavaria fusiformis) is a common fairy club fungus of short grassland and woodland clearings. This inedible fungus can appear in very dense clumps. In Britain and Ireland Golden Spindles fungi are a fairly common find in unimproved grassland in most areas, the distribution being limited by their dependence on high-quality habitat. This species occurs throughout mainland Europe, where it is most common in cooler northern countries. Golden Spindfles is also recorded in many other parts of the world including North America, where it is most commonly found in woodland habitats. This fairy club fungus was described in 1799 by the English mycologist James Sowerby (1757 - 1822), who gave it the binomial scientific name Clavaria fusiformis. It was not until 1950 that the currently accepted scientific name Clavulinopsis fusiformis arose, when British mycologist Edred John Henry Corner (1906 - 1996) transferred this species to the genus Clavulinopsis. Synonyms of Clavulinopsis fusiformis include Clavaria fusiformis Sowerby, Clavaria ceranoidesPers., Ramaria ceranoides (Pers.) Gray, and Clavaria fusiformis var. ceranoides W.G. Sm. The origin of the generic name is the Latin noun clava meaning a club, with the suffix implying that it looks quite similar to species in the genus Clavulina. 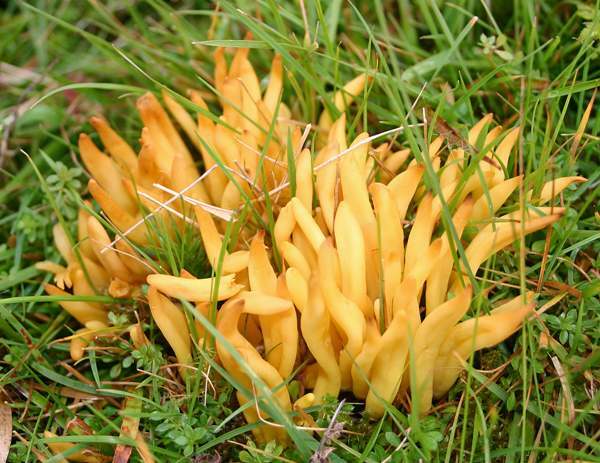 The Clavulinopsis genus is closely related to Clavulina and Clavaria, but fungi in the Clavulinopsis group have tougher, less brittle fruitbodies that are solid rather than hollow in structure. The most obvious microscopic difference is that Clavulinopsis species have clamp-connections in the tramal tissues. The specific epithet fusiformis also comes from Latin and and means 'in the form of a spindle' - in other words, narrow at the base and at the tip but rather wider in the central region. Other common names of this species include Yellow Spindle Coral, Golden Fairy Spindle, Tongues of Flame, and Slender Golden Fingers. 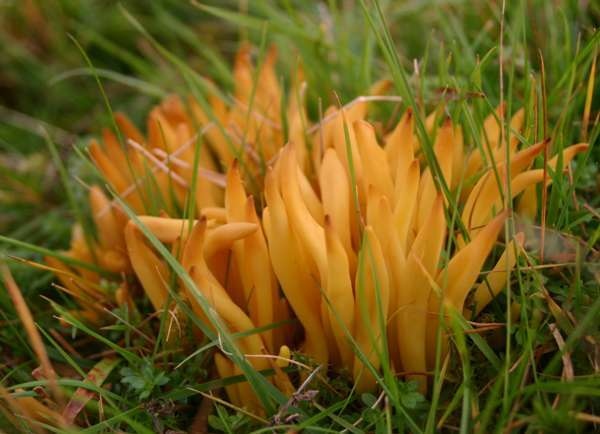 The unbranched yellow fingers of this grassland fairy club fungus are laterally compressed and the tips quite sharply pointed. Some of the broader fingers may have distinct longitudinal grooves. The individual clubs are typicaly 2 to 6mm wide and 2 to 8cm tall, and they emerges in tight clusters from an underground fused base. Broadly ellipsoidal to subglobose, smooth, 5-9 x 4.5-8.5µm; with a prominent apiculus (where they were originally attached to the basidium). Odour not distinctive; taste slightly bitter. Saprobic, growing from the soil in short grassland and woodland edges/clearings. 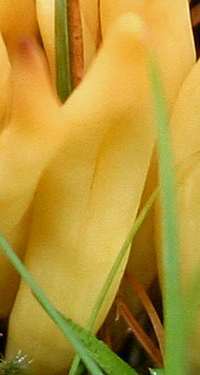 Clavulinopsis luteoalba, the Apricot Club, is similar in size and colour but has pale club tips; it forms dense tufts of clubs that are lateraly compressed and sometimes forked.